Cabling requires a double-pointed needle to hold the first stitches out of the way until they are needed. The cable needle should be about the same size or smaller than the working needles, certainly not larger, as this would be difficult to knit from after the stitches are crossed. 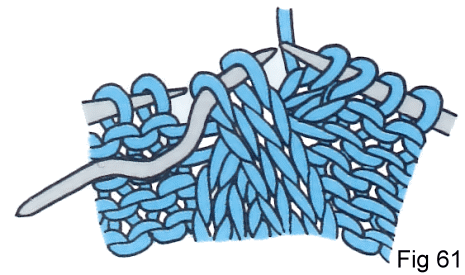 Cables differ in the number of stitches being used, the number of rows between the crossover and the direction of the crossover, left or right. Generally, cables are worked over an even number of stitches, with half the number crossed over or under the remainder, although this can vary to give many interesting effects. 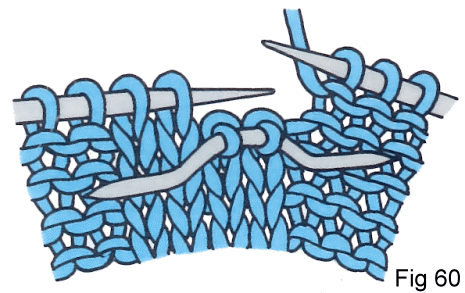 Cables are normally worked in stocking stitch on a background of reverse stocking stitch. If cables are worked during shaping (as in a V-neck or armhole) there may not be enough stitches to work the complete cable. In this case you should work the odd stitches in stocking stitch (or whatever other background stitch you are using), as it is obviously not possible to work half a cable. This will produce a left twist cable. 1. 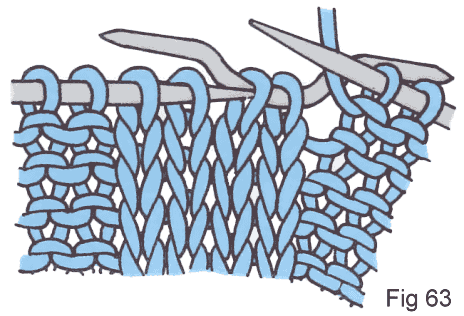 Working in stocking stitch on a ground of reverse stocking stitch, place the first 2 stitches on a cable needle and leave them at the front of the knitting (Fig.60). 2.Knit the next 2 stitches from the left hand needle (Fig.61). 3. Knit the 2 stitches from the cable needle, taking care to knit them in the same order as they came off the needle (Fig.62). This will produce a right twist cable. 1. 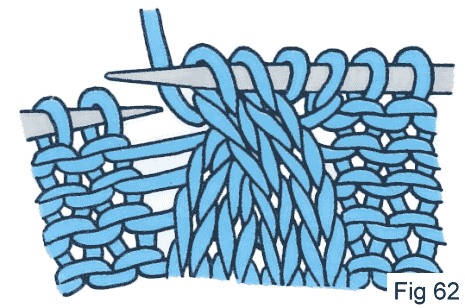 Place the first 2 stitches on a cable needle and leave them at the back of the knitting (Fig.63). 2. Knit the next 2 stitches from the left hand needle, followed by the 2 stitches on the cable needle in the correct order as before.